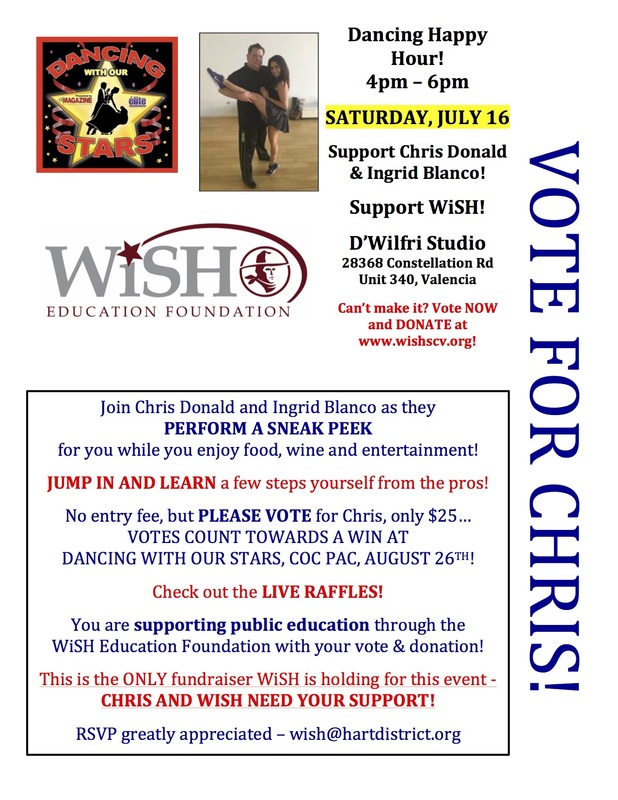 Hello friends, I need your support….Chris Donald, one of our WiSH Directors, is dancing for us at Dancing with Our Stars on August 26th at COC PAC. We are having ONE FUNDRAISING NIGHT ONLY – and it’s going to be FUN! It’s a DANCING HAPPY HOUR – food, wine, sneak peek performance and a chance to learn some moves.Saturday, July 16 from 4-6 pm only. No fee, but please support us with a vote for Chris for $25 – EVERY DOLLAR BENEFITS WISH but counts towards the voting for DWOS! All donations happily accepted! See below for more information! Please SHARE this flyer and bring some friends for a fun way to begin your Saturday evening out! 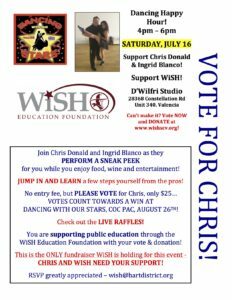 It will be such a great time, but if you are unable to make it, PLEASE support us by voting for Chris at http://www.wishscv.org/event-detail.php?ID=dv9.